Brilliant and beautiful Hellenistic Neoplatonist philosopher, mathematician, astronomer, astrologer, and teacher, who was savagely murdered by archbishop Cyril and his fanatical Christian mob. Alexander the Great who conquered most of Persia in the third century BC decided to build a great city after his name -Alexandria, which was founded in April of 331 BC. It was located on the northeastern coast of Egypt, facing Greece, and its purpose was to collect and store all of the world's greatest knowledge, so that it would become the greatest and most powerful city in the world. At its peak around 230 BC, the Library had some 400,000 or more papyrus scrolls and attracted the most brilliant minds in the world. The city of Alexandria did remain a great cultural and political center for almost 1000 years, but the Library of Alexandria had a shaky and tumultuous history. It faced many destructions most notably from the incursions of the Roman Empire and the meddling of the Catholic Church. In 391 AD the Sarapeum, the last and largest depositary of books was destroyed by Christians leaving only the School of Theon where Hypatia administered and taught. She and her school were spared because of the important ties she had with Roman dignitaries, and because she was greatly beloved and respected by all. Unfortunately, this would not last very long. 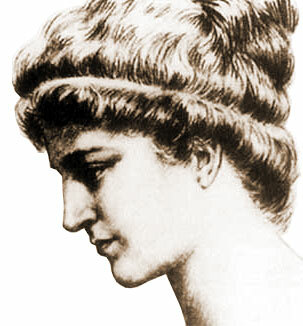 Hypatia was a Neoplatonist philosopher, astronomer, astrologer, and mathematician who fearlessly counseled both great and small, and produced many commentaries or writings. She tolerated all religious beliefs and often tried to reconcile them. She was a celibate, an ascetic, and believed in astrology and reincarnation. Palladus, in his poem, links her to the House of Virgo. Whether this means the Sun or Ascendant is uncertain. She also built and used astrolabes and hydrometers. One day, in 415 AD, while returning home from work, she was accosted by an angry Cristian mob, dragged into a church, stripped naked and cut to death with sharp broken pottery. She was then dismembered and all her parts scattered. It is believed the mob was sent by Cyril(bishop of Alexandria) as a revenge for counselling Orestes(Prefect of Alexandria) against him. Hypatia's death shocked everyone and she was instantly made a martyr, as well as perhaps(some say) an example to all women who exceeded their traditional roles. There is very little detailed information about Hypatia that is accessible online or elsewhere, perhaps because all of her works were immediately destroyed or confiscated upon her death, yet she lives on in our hearts and minds.